Most athletes focus on aerobic exercise to build their endurance, but some athletes neglect an equally important area of exercise: strength training. Even for sports such as swimming or running in which packing on muscle mass is undesirable, strength training can be tremendously beneficial. One of the biggest benefits of strength training is its ability to reduce sports injuries. When practicing for a specific sport, you tend to work the muscles that are most commonly used in that activity. This leaves your other muscles vulnerable to weakness that can increase your risk of injury. Cross-training is the best way to prevent this type of specific muscle weakness. Muscle imbalances develop when a certain muscle group becomes much stronger than its opposing group. For example, if your hamstrings become very strong, your quadriceps may be too weak in comparison. Not only does this cause the weaker muscles to fatigue more quickly , but the intense contractions of the stronger muscle group could actually damage the weaker muscles. Muscle imbalance may lead to strained muscles or torn ligaments. Strength training ensures that your lesser-used muscles remain strong enough to work well with their opposing muscle group. 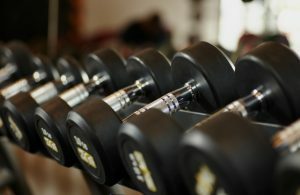 A balanced strength training program will focus on all muscle groups to alleviate any imbalance. When your body is properly aligned, it can easily engage in intense physical activity without ill effect. However, if your muscles, tendons, ligaments or bones become misaligned with respect to one another, they can no longer work together seamlessly. Strength training involves fluid movements that promote excellent body alignment, significantly reducing your injury risk. The specific guidelines for strength training depend on your personal fitness goals as well as the sport you play. Consulting with sports medicine orthopedic associates is a good way to ensure your strength training program is appropriate for you. In general, athletes should engage in strength training at least two to three times per week. You should focus on all major muscle groups without working the same muscle group two days in a row, which could increase your risk of injury. Getting an injury could derail your entire season or even permanently affect your level of play. For amateur and elite athletes alike, strength training is an excellent way to decrease your injury risk. Visit our sports medicine orthopedic specialists today to see how we can help you bounce back from an injury or prevent a sports-related orthopedic problem.